New technologies give us the power to do our best work and the means to reach our dreams. Every product of development can set us free in different ways. AV Voice Changer Software DIAMOND, an Audio4fun software tool that can open a new world of sounds and music, is a clear example of this. It is not just a piece of software, it is the masterful assistant that all audiophiles desire. The main feature of AV Voice Changer Software DIAMOND is, of course, to change the voice. This Audio4fun’s product provides you with really powerful modules to do this job, to unleash your creativity and unlock a new audio world. To control it effectively, you have to master a very original Audio4fun concept – “nickvoices,” aka the ready-to-use output voices. These things help you make all possibilities true and break all normal logic. Inspired by real persons or movie characters, nickvoices gives you the ability to joke in the most stylish way or even live the others’ lives naturally. With them, you are free to force the scariest ghost to sing the loveliest lyrical, or make the noblest woman scream and shout in your very own ways. All things are assured as AV Voice Changer Software DIAMOND is compatible in most environments. Chatting like an undercover agent, gaming like a werewolf, or even singing in an elephant’s voice, everything is possible with this Audio4fun’s masterpiece. The most satisfying aspect of getting this product is your free, unlimited access to the huge online store of nickvoices and sound effects. You can always download them from Audio4fun’s add-on treasures, and all are for free. How amazing! As the premium of this Audio4fun’s line, AV Voice Changer Software DIAMOND provides you with the most convenient features. Besides using the ready-to-use nickvoices, you can create ones of your own or even mix them together, creating products with your own, personal style. You may also use this program as an audio player, converter or even recorder. Things always go well and the outputs can be saved in a variety of formats, but the most important feature is that this can all be done in real time, whether you are online or actively creating a sound. 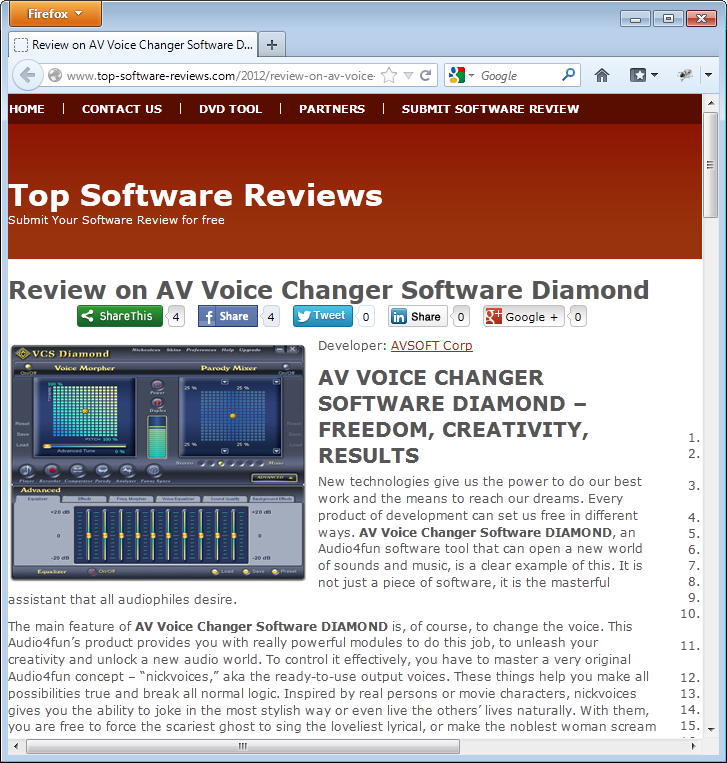 AV Voice Changer Software DIAMOND has all it needs to become an audiophile’s top assistant. That’s why it has been Audio4fun’s best-seller for a long time. Tests have been made and facts have been proved; let’s visit //www.audio4fun.com/voice-changer.htm for more information and make a decision. Editor Review list See this review fromTop Software Review’s product download page.